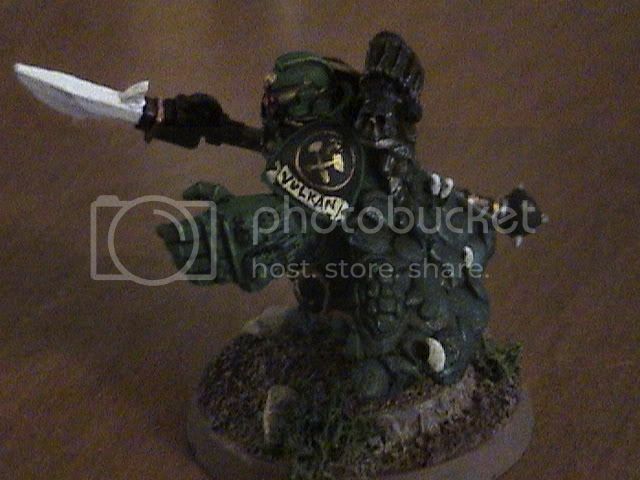 There's the guy, painted. There are a few areas that need another go over, but largely, Vulkan's table top ready. He's painted in typical Salamander colors -- or at least their equivalent -- as far as the green and lighter green highlighting. The back pack I left understated. Yes, it's covered with bones and skulls, but leaving it black with a dark gray highlightwill marry the miniature to a larger Salamander force while still setting him apart. I also came down on the side of "fluff": Yes, the Salamanders make great artificer armor, but they've also got a humble streak in them. 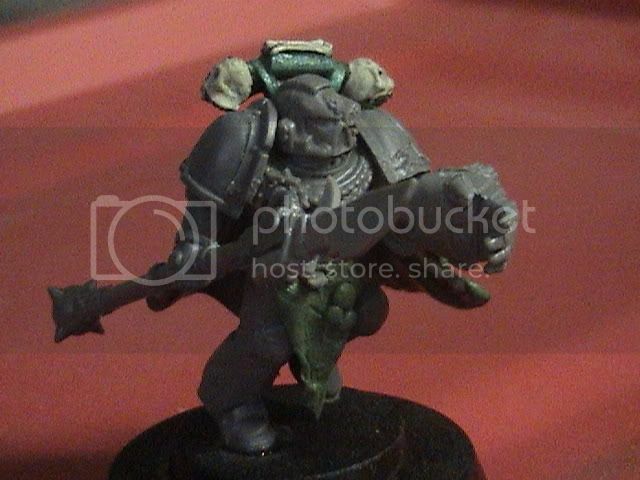 He'Stan's pic in the New Marine Codex shows a nice piece of artwork on his left shin-plate. On that small of a space, and with my eyes, that's a stretch, but I did pull it off somewhat in miniature, pictured below. The inside of the cape: I went away from the tanned leather look and did a few decorative lines and some hammer symbols. The spear's shaft was done with GW's "Tin Bitz", but to me it looked like mahogany or some rich wood. Maybe if it were decorative only... So making a bunch of tiny letter "S"'s with a copper paint hopefully gives it a more metallic look. I left the blade itself plain white. 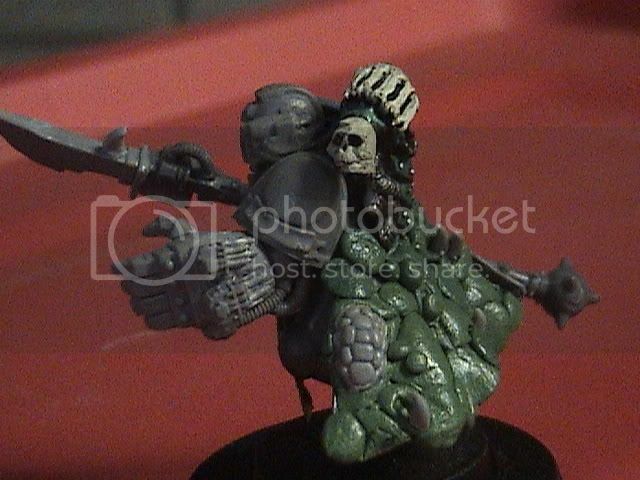 It's stated to burn white hot and with the overall darkness of the rest of the model, I like the way it stands out. I know, the crossed hammers look a little lame and I'll fix them. But for the 3+ Invulnerable save giving mantle, I painted it a darker green then dry brushed it with a metallic paint called "Crystal green". Like the backpack, it's understated, even with the bony protrusions, but still stands out as a lizard's hide that could survive sunbathing next to a lava flow. The Space Marine Captain body is a good place to start because of the cape if nothing else, but the set itself has lots of extras in it. I used a more tech looking head because among all his other sweet attributes, He'stans got digital weapons. Assault Marine legs are good for the action pose and worked out well I think. 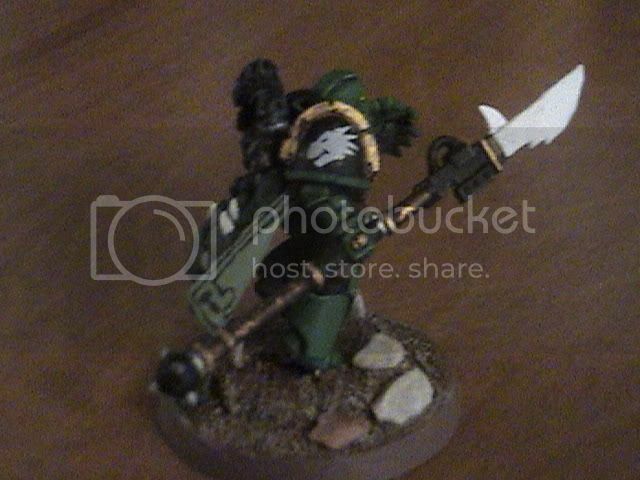 Since he is a Salamander -- essentially a Chapter of Blacksmiths -- I used an old Legion of the Damned back pack to convey a little sense of that artificer armor and in the same vein put a Chaos shoulder pad over his right arm, with the arrows shaved and smoothed off. After shaping and detailing the bottom half of his mantle out of greenstuff, I added a couple teeth to it and then tore it downwards giving it a rougher look. 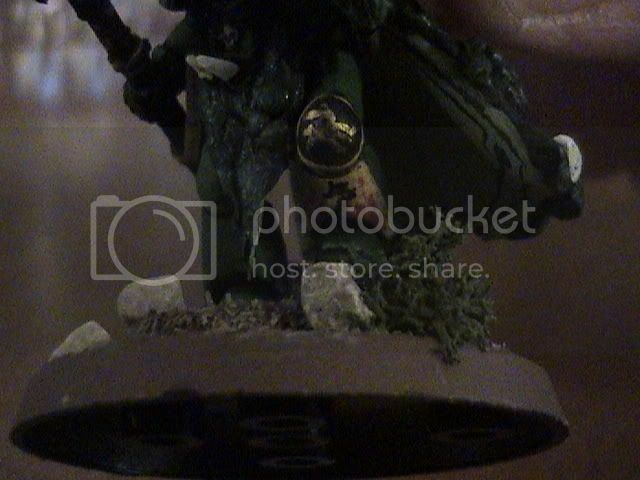 The Mantle conveys a 3+ Invulnerable Save to He'stan so I went for a chunky scale appearence, rolling several sizes of greenstuff balls and smashing them in place on the plastic cape. A few teeth from Fantasy Ork sheilds and a Tyranid node accessory reinforce the whole "hide" motiff and I think make that awesome save of his believable. For his Gauntlet of the Forge -- a heavy flamer, twin linked just because it's his -- I scraped the wolf skull and bones from a Space Wolf power fist and set two Imperial gun turrets from Battlefleet Gothic on it. These have to be shaved and trimmed with the curve of the fist in mind and the gun barrels bent downward for the same reason. The spear is a master crafted relic blade and needed a spiked ball from the Empire Flagellants set on its end, just because. 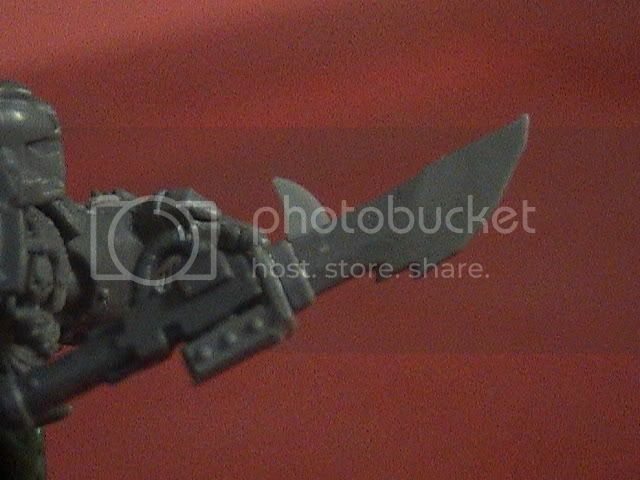 The business end of the spear is made from two different Ork knives/Choppas. The illustration in the new Marine Codex has a clean looking blade, but I liked the serated edge better. A spike from the Dark Eldar accessories completes the halbrid. 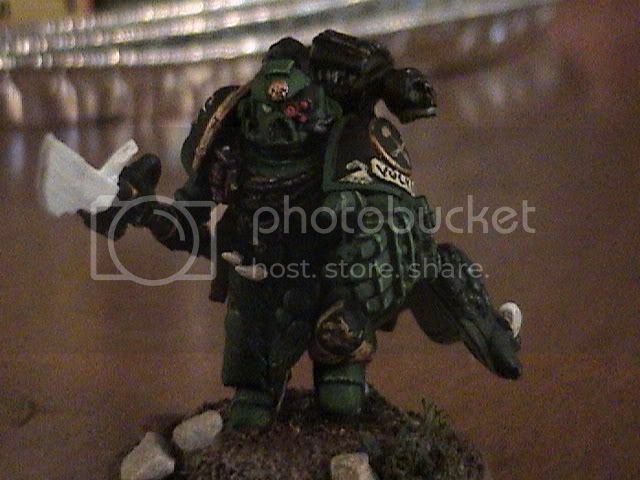 Not pictured is the simple bolt pistol-in-holster glued to his right hip because first off, he's a Space Marine and needs a firearm despite his weighty arsenal, two, because it's partof his wargear and three, because he's hardly going to draw and fire it with the gauntlet on his left hand. Now to paint it.